Original Pub. Date: Nov. 13, 2016. Last Update: Feb. 7, 2019. Westerners are not only known as history ignoramuses, but double dumbass history ignoramuses when it comes to paleontology (palaeontology), paleontology history and paleontologists. Since I'm the one-and-only Historyscoper (tm), let me quickly bring you up to speed before you dive into my Master Historyscope. Paleontology (Gr. "palaios" + "ontos" + "logos" = "ancient" + "creature" + "study") began when the first fossils were dug up. At first, scientists considered them proof of Noah's Flood, but finally changed over to an evolutionary viewpoint, which was given a rocket boost by Charles Darwin's "The Origin of Species" (1859). Nowadays paleontologists claim to own the Great Track of Time from the Holocene Epoch (-9.7K B.C.E.) on back, even inventing their own time scale called Before Present (B.P. ), which runs backward from Jan. 1, 1950; originally it referred to the advent of radiocarbon dating, but since that coincided with the testing of nukes in the atmosphere, it's on its own now. Either way, the entire time scale is theoretical, and could be totally wrong, especially if the Bible Book of Genesis is right, so we will concentrate on the paleontologists and their discoveries and alleged dating without passing judgment on the truth of it, leaving that to you. In Apr. 1796 French naturalist Jean Leopold Nicolas Frederic Georges Cuvier (1769-1832) gives the lecture Mémoires sur les espèces d'éléphants vivants et fossiles at the Nat. Inst. (pub. in 1800), comparing skeletons of Indian and African elephants, and mastodons ("the Ohio animal"), which he concludes are all different species, the latter extinct; in 1806 he coins the name "mastodon"; he also describes a large skeleton found in Paraguay, which he names the Megatherium, claiming it is an extinct variety of the tree-dwelling sloth, ending the debate about whether extinction has actually happened, and founding Comparative Anatomy and Paleontology. In 1798 he pub. Tableau élémentaire de l'histoire naturelle des animaux, becoming the first attempt at systematic classification of the animal kingdom, founding modern Zoology (Comparative Anatomy), stressing how the parts of an organism are correlated to the functioning whole. In 1812 he pub. Recherches sur les Ossements Fossiles de Quadrupedes (Researches on Quadruped Fossil Bones), issuing his "rash dictum" that it is unlikely that any large animal remained undiscovered. In 1813 he pub. Essay on the Theory of the Earth, which advances the theory of catastrophism in geology, claiming that new species were created after periodic catastrophic floods after establishing the fact of past extinction. In 1817 he pub. Le Règne Animal (The Animal Kingdom) (4 vols. ), his magnum opus, a summation of his life's work on comparative anatomy, containing apparent support for evolutionary change for the extinct mammoths et al., making a fan of Charles Darwin, although Cuvier rejects the idea of evolution. In 1822 an ed. of a French scientific journal coins the word "paleontology" for the study of ancient living organisms through fossils. In 1832 English paleontologist Gideon Algernon Mantell (1790-1852) discovers the Hylaeosaurus in Tilgate Forest, England, becoming the 3rd dinosaur to be named. In 1860 French geologist-paleontologist Edouard (Édouard) Lartet (1801-71). discovers remains of the Aurignacian Culture in Aurignac in Haute-Garonne, SC France, dated about -40K, later known as the first modern humans of Europe. In 1868 his paleontologist-geologist son Louis Lartet (1840-99) (son of Edouard Lartet) discovers the first remains of the Cro-Magnons in Les Eyzies, Dordogne, France declaring them the first homo sapiens in Europe, and the successor of Neanderthal man, living about -45K; later the term European Early Modern Humans is preferred. In 1861 a fossilized feather of magpie-size bird-like dino Archaeopteryx (Gk. "ancient wing/feather") (Ger. Urvogel = first bird) (dated 153M B.C.E. ), the most primitive known bird is found in Late Jurassic limestones in the Aolhofen area of Bavaria, S Germany; birds are the only surviving example of Dinosauromorphs, the direct sister groups of dinosaurs; too bad, in 2019 the feather is reported to not be from Archaeopteryx, but a relative. In 1868 the first remains of the Cro-Magnons are discovered in Les Eyzies, Dordogne, France by French paleontologist Louis Lartet (1840-99), declaring them the first homo sapiens in Europe, and the successor of Neanderthal man, living about -45K; later the term European Early Modern Humans is preferred. In 1877 the Bone Wars (Great Dinosaur Rush) in the Morrison Formation in Colo., Neb., and Wyo. between rival paleontologists Othniel Charles Marsh (1831-99) of Yale U. and Edward Drinker Cope (1840-97) of the Philly Academy of Natural Sciences begins, spending their wealth to discover 142 new species of dinosaurs by 1892, only 32 of which are found to be scientifically valid; Marsh hires English geologist-artist Arthur Lakes (1844-1917), who makes the mistake of cooperating with Drinker, heating-up the war, going on to discover the Dinosaur Ridge formation in Morrison, Colo; discoveries incl. 30-ft.-long walnut-size-brain armored herbivore Stegosaurus (Gk. "covered lizard") in W U.S. (Morrison Formation) and Portugal, discovered in 1877 by Marsh and given the name Antrodemus, becoming one of the first well-known theropod dinosaurs; 38-ft.-long Allosaurus (Gk. "different lizard") (largest carnivore in North Am. ); 85-ft. long sauropod dinosaur Brachiosaurus (Gk. "long-armed lizard") in the Morrison Formation; 90-ft.-long Apatosaurus (Gk. "deceptive lizard"), formerly called Brontosaurus (Gk. "thunder lizard"), coined in 1879 by Marsh until a war with Philly Academy of Natural Sciences rival Edward Drinker Cope (1840-97) is settled in Cope's favor in the early 20th cent. ; the Brontosaurus name is restored in 2015; 90-ft.-long 45-ft.-tall 12-to-18-ton long-necked plant-eating Diplodocus (Gk. "double-beamed") (coined in 1878 by Marsh) of W North Am. ; 138-ft.-long Supersaurus is found in the Morrison Formation and Portugal, AKA by its ephemeral alternate name Ultrasaurus. In 1884 Albertosaurus (dated to -70M), a somewhat smaller (30-ft.-long) version of the T-Rex living in W Canada is discovered by Canadian geologist Joseph Burr Tyrrell (1858-1957). In 1887 Argentine naturalist Florentino Ameghino (1854-1911) becomes excavating fossil mammals in Patagonia with the help of his brother Carlos Ciriaco Ameghino (1865-1936), discovering 8-ft.-tall carnivorous bird Phorusrhacos in 1887. In 1888 English paleontologist Harry Govier Seeley (1839-1909) divides dinosaurs into Saurischians and Ornithischians based on their pelvic bones and joints; it takes until the 1980s to prove that both groups have a common ancestor in the Triassic Period. In 1902 Am. paleontologist Barnum "Mr. Bones" Brown (1873-1963), who began excavating in Wyo. in the late 1890s then switched to Hell Creek Formation in SE Mont. discovers the first T-Rex fossil. which is housed in the Carnegie Museum of Nat. History in Pittsburgh, Penn. ; Henry Fairfield Osborn (1857-1935) makes the First Drawing of a T-Rex - and his boy was named Sue? In 1909 Am. paleontologist Charles Doolittle Walcott (1850-1927) discovers well-preserved fossils in the Burgess Shale of Mt. Burgess in British Columbia, Canada, leading to the theory that a complete ecosystem existed there in Cambrian seas 515M years ago after the Cambrian Explosion - is that a trilobite in your pocket or are you glad to see me? On Nov. 7, 1910 German paleontologist Baron Ernst Stromer von Reichenbach (1871-1952) arrives in Alexandria, Egypt, going on to discover the first dinosaurs in Egypt, incl. huge late Cretaceous (-100M) Spinosaurus aegyptiacus (1912), the largest known predatory dinosaur, Carcharadontosaurus (1914), Aegyptosaurus (1932), Bahariasaurus (1934), and Stromatosuchus; too bad, in 1934 his entire collection in the Munich Museum is destroyed by an Allied bombing raid. In 1921 Edgar Dacque (Dacqué) (1878-1945) of the U. of Munich pioneers phylogentically-oriented paleontology, becoming especially interested in the origin of human bipedalism, but eventually goes off the deep end into mythology and gets a bad rep? - Wacque Dacque? In 1933 White Plains, N.Y.-born paleontologist Alfred Sherwood Romer (1894-1973) pub. Vertebrate Paleontology, proposing the Romer Classification, which lays the foundation for the traditional classification of vertebrates and becomes a std. textbook. He also proposes the Romer's Gap of about 15M years about 360M y.a., caused by the Hangenberg Event, an anoxic period in the late Devonian marked by black shale, proposing that fish developed limbs to help them cross the desert to find another shrinking pond. In 1933 Yang Zhongjian (Chung Chien Young) (1897-1979) begins excavating in China, going on to discover Yunnanosaurus, Lufengosaurus, Dsungaripterus, Tsintosaurus, Mamenchiasaurus, and Chialingosaurus, becoming known as "the Father of Chinese Vertebrate Paleontology". Oh, what a rush! Here come the new tag team champions? In Aug. 1964 speedy 10-ft. 150 lb. stripey early Cretaceous Deinonychus (Gk. 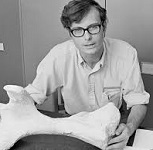 "terrible claw"), a pack-hunting dino with a 3-fingered grasping hand and a foot with an inner toe that sticks out like a sharply curved sickle is discovered by Yale U. paleontologist John Harold Ostrom (1928-2005) and his asst. Grant E. Meyer in S Mont. 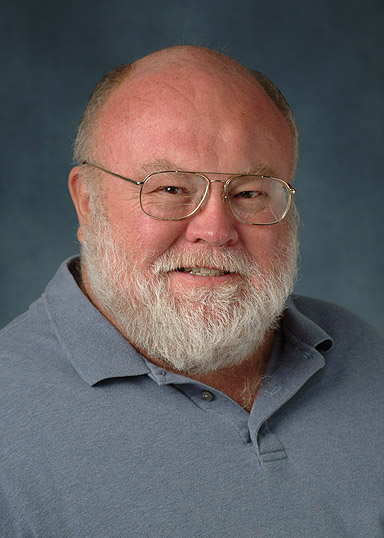 ; in his research report, Ostrom describes it as a raptor, killing its prey by leaping and slashing with its claw, suggesting a high metabolism rate and thus warm-blooded system, in 1969 resurrecting Thomas Henry Huxley's theory that birds evolved from dinosaurs; the dino-bird link excites a new generation of researchers to reinvigorate a fossilized, er, moribund field. In 1970 Ostrom discovers a miscatalogued specimen of archaeopteryx among pterosaurs in a museum in Haarlem, Netherlands, prompting him in 1976 to repopularize the 19th cent. hypothesis that carnivorous dinos are direct ancestors of today's birds, which is deflated by a 2009 discovery by researchers at Oregon State U. about how birds breathe; by 2005 only 10 archaeopteryx specimens are found; one specimen sells for $1.3M in 1999; another ends up in the private Wyoming Dinosaur Center in Thermopolis, Wyo. in 2005; in 2009 Gregory M. Erickson of Fla. State U. claims that its slow bone growth makes a feathered dino not capable of flight - it's my favorite movie? In 1971 Am. geologist-paleontologist Douglas A. Lawson (1947-) discovers giant toothless pterosaur (up to 12m wingspan) Quetzalcoatlus (named for the Aztec feathered serpent god Quetzalcoatl) in Big Bend Nat. Park in Tex., becoming the largest known flying creature, weighing only 200 lb. max, and dating to 68M B.C.E. In 1972 Am. paleontologists Stephen Jay Gould (1941-2002) and Niles Eldredge (1943-) pub. the Theory of Punctuated Equilibrium to explain why evolution seems to occur in short bursts not continually, claiming it does it via one species splitting into two species (cladogenesis), without explaining how it works or turns on and off? In 1976 Alioramus (Gr. "different branch") (dated to -70M), an 8-horned "ballerina" relative of T-Rex living in Mongolia is discovered by Soviet paleontologist Sergei Mikhailovich Kurzanov (1947-); in 2001 Am. paleontologist Stephen Louis Brusatte (1984-) discovers the species Alioramus altai, becoming the only known dino with a horn sticking out of each cheek. In 1981 Kurzanov announces the small bird-like 5-ft. long oviraptorosaurian ("egg thief lizard") therapod dinosaur Avimimus (Gr. "bird mimic") (dated to -70M), also living in Mongolia. In 1978 duck-billed dino Maiasaura (Gr. "caring mother lizard") is discovered in Mont., and dated to -76.7M; in 1982 Am. paleontologist John R. "Jack" Horner (1946-) discovers evidence of parental care in the fossils, becoming the first known motherly dino. In 1978 Am. Nobel Prize-winning physicist Luis Walter Alvarez (1911-88), his geologist son Walter Alvarez (1940-) et al. propose the Asteroid Impact Theory of Dinosaur Extinction to explain the unusual abundance of iridium associated with the K-T Extinction Boundary (65M B.C.E. ); 1990 studies of the impact crater of Chicxulub in the Gulf of Mexico lend support to their theory - asteroid theories are eco-friendly? In 1983 Norwegian paleontologist Jorn (Jörn) Harald Hurum (1967-) of Oslo U. discovers the 3-ft.-high lemur-like primate Darwinius massilae (named after the 200th anniv. of Darwin's birth in 1809, plus the place it was found) in the Messel Pit near Darmstadt, Germany, and unveils it to the public on May 19, 2009 with the nickname Ida (named after his 6-y.-o daughter), billing it as the missing link between apes and monkeys, incl. humans after two years of secret study by too bad, later in 2009 Erik Seiffert of Stony Brook U. in N.Y. proves that it is an evolutionary dead end with no connection - boy if he could talk? In 1984 the Sun's possible dim low-mass red or white dwarf star hidden companion Nemesis, orbiting at 50K-100K AU is proposed by Am. 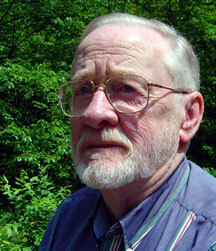 paleontologists David M. Raup (1933-) and J. John Sepkoski Jr. (1948-99) to explain an alleged 27M-y. cycle in mass extinctions; there's 16M years left before the next peak in the cycle; in 2010 Adrian L. Melott of the U. of Kan. et al. point out that if Nemesis existed its orbital period would change by 20%-50% due to gravitational attraction of nearby stars, killing the theory. In 1990 40-ft.-long Sue (dated to -67M), a Tyrannosaurus Rex (T-Rex) (Gr. "tyrant lizard") is discovered in 1990 by Am. paleontologist Susan "Sue" Hendrickson (1949-) in the Black Hills of S.D., and auctioned to the Field Museum of Natural History in Chicago, Ill. in Oct. 1997 for $7.6M, becoming item #PR 2081; she died from trichomoniasis? ; the T-Rex is cannibalistic? - last to come to Jurassic Park, but sells all the tickets? In 1991 Am. paleontologist Paul Callistus Sereno (1957-) of the U. of Chicago Am. discovers early dinosaur (-231M) Eoraptor in the Valley of the Moon in South Am., going on to make many more discoveries and become a superstar. In 1994 giraffe-like Sauroposeidon ("lizard Poseidon") in Okla.-Tex. is discovered by U. of Okla. paleontologist Richard Cifelli (1954-), becoming the largest creature ever to walk the Earth (ca. 110M B.C.E. ), reaching 56 ft. in height, 98 ft. in length, and 60 tons in weight; the four neck vertebra discovered in 1994 are up to 10 ft. long each, and were first thought to be tree trunks. In 2000 Am. 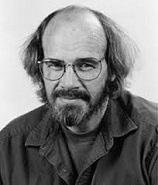 paleontologist John R. "Jack" Horner (1946-) of the Museum of the Rockies in Bozeman, Mont. and his team discover five separate T-Rexes, increasing the world collection by 35% - which makes you wonder about what?